Today is the second game for The Netherlands in the World Cup and of course I had to show my support the best way I can: on my nails! After going all out with a bright, in your face neon orange last time, I decided to keep it simple and a little more subdued for this game, by just doing an orange accent nail. 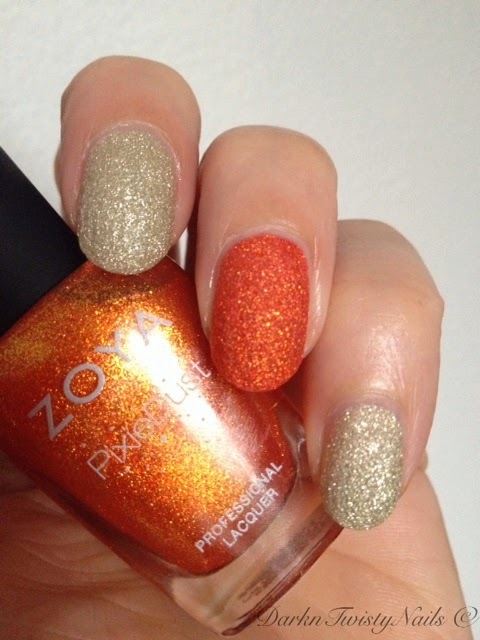 I used 2 Zoya Pixie Dust polishes, they truly are my favorite textured polishes. My overall color is Tomoko and the accent is my most recent purchase (well, when it comes to Zoya anyway) Dhara. I absolutely love both of them and think this is a very classy mani, with a nice pop of color. For the next game, I have a little nail art with both these polishes and a couple more in mind, so stay tuned for that! Our boys are playing Australia tonight and although I'm rooting for us to win, I always have a soft spot for this particular country. It reminds me of the year I spend there, getting to know myself (and having the best time!). Will you be watching? leuk alleen waarom post je in het engels?? Ik blog in het Engels omdat ik hier voor gekozen heb aangezien ik niet altijd in NL gewoond heb en iIk heb ook lezers (en vrienden) heb die geen Nederlands spreken. Love the Zoya's Pixie Dusts, so pretty! Thanks, the Pixie Dusts are the best textures ever!